Izzie’s released a new eyes set, which is available now at the mainstore and on Marketplace. The Taleah eyes come in 18 colors and apply to left and right eye individually. They include mesh eyes, system eyes and appliers for Catwa, LeLutka and Omega. Please try a free DEMO before purchasing! Izzie’s released a light colors edition of the Tokyo Eyes at the mainstore and on MP that includes 1 pair of mesh eyes with texture change Hud where you can choose from 12 colors (each eye can be textured separately), system eyes and Catwa appliers for Catwa Rigged Eyes and Catwa Mesh Eyes – will NOT work for Catwa Basic Eyes (each eye can be textured separately)! Please try a free DEMO before purchasing! Izzie’s is offering an Initial Bracelet Gacha and an Exclusive Two Initial Charms Necklace set at The Epiphany! You can get 14 commons and 1 rare. 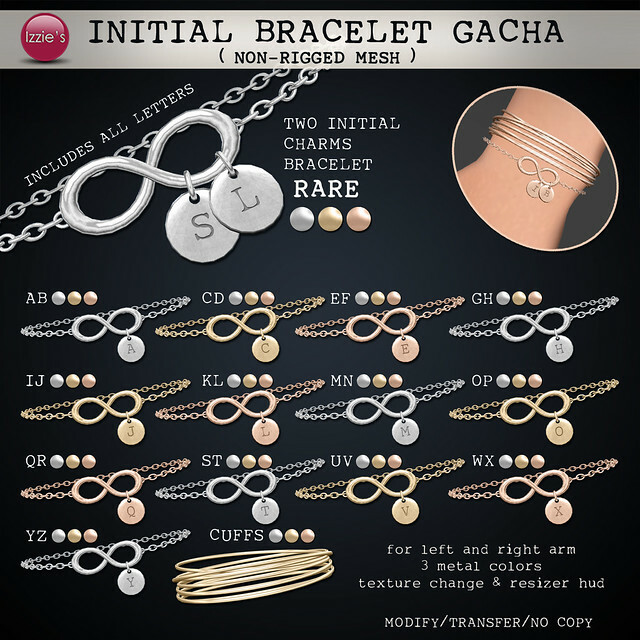 Each common initial bracelet comes for left and right arm, with 3 metal options and you can choose from 2 letters you want to show on your bracelet charm (see gacha key). Additionally you can combine them with metal cuffs, which are also a common item to get. The rare bracelet has 2 charms and you can choose from all letters, and also from 3 metal colors. What i love about this event is that you have the possibility to redeem your unwanted gacha items for points to purchase exclusive items that will never be sold again. 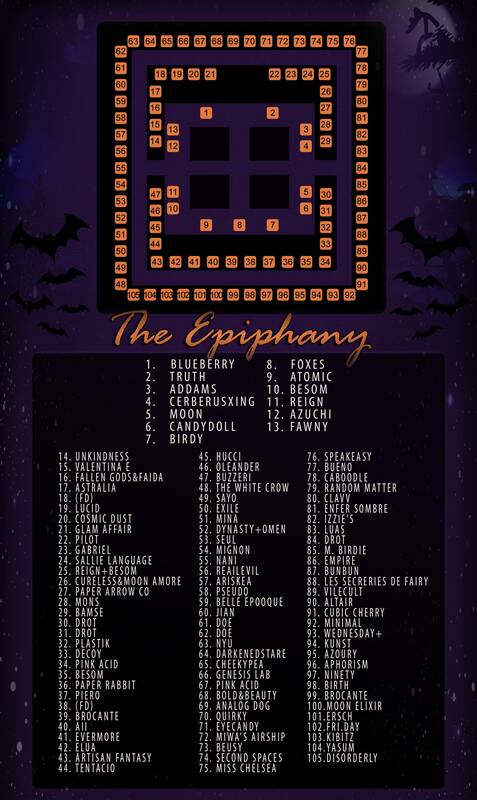 Commons are 1 point each and rares 3 points, 1 Epiphany Exclusive item costs 25 points. When you rez or wear the boxed item, you get asked if you want to turn in prize for points or if you want to keep the item – if you choose “keep” the item can no longer be exchanged for Epiphany Points, if you choose “turn in” your item will disappear and you get points to purchase exclusive items. And of course your gacha items can be gifted to friends as well. The exclusive item can be found at The Epiphany next to the gacha machine and at Izzie’s mainstore. 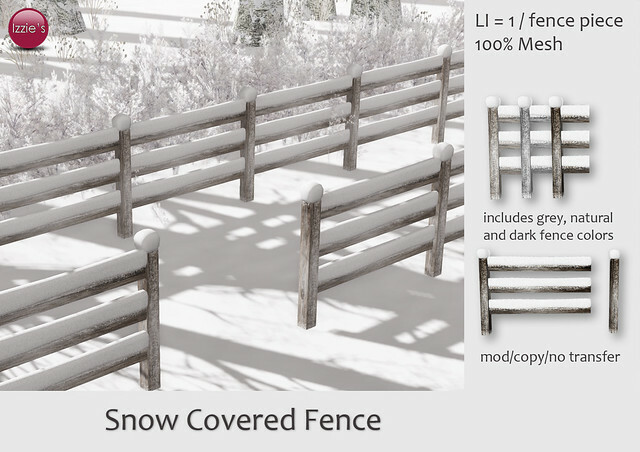 Izzie’s released a 100% mesh Snow Covered Fence at the mainstore (near landing point where the 2 little sheds are) and on Marketplace. The set includes grey, natural and dark fence colors, each piece has a land impact of 1 and permissions are modify/copy. If you want to see how it looks rezzed inworld, I placed a sample at Izzie’s mainstore near the landing point. 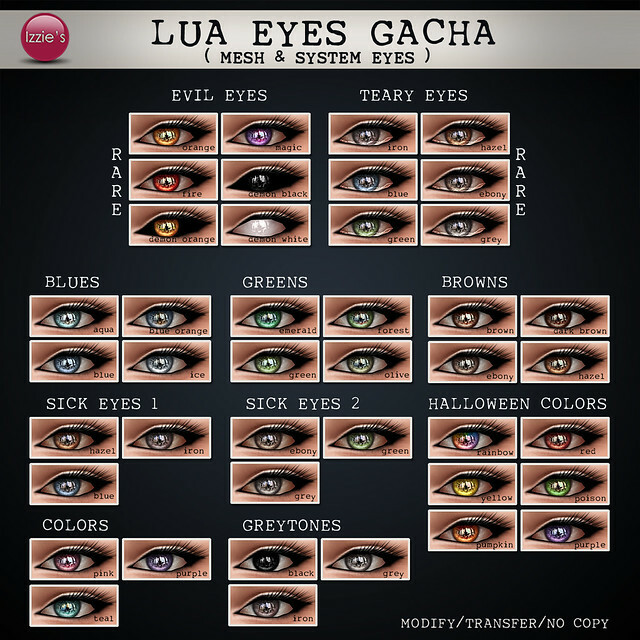 Izzie’s is offering a Lua Eyes Gacha and an Exclusive Lua Eyes Light Tones set at The Epiphany! You can get 8 commons and 2 rares (evil eyes and teary eyes). You get 3-6 eye colors per play (see gacha key). Izzie’s is offering Wounded Angel Skin appliers for Catwa mesh heads in 3 skintones including 9 eyebrow options (on skin), closed eyes, eyeliner and dark circles, 7 lipsticks, burn intensifier, system body base and mesh body appliers for Slink, Maitreya and Belleza at the current Uber “Freestyle” round. Additionally you can get a matching Wounded Angel Mesh Eyes set that comes with a texture change Hud where you can choose from 6 clear and 6 cloudy eye options (each eye can be textured separately). Please try free demos before purchasing, you can try them at Uber and also at Izzie’s mainstore.